Furniture that has been damaged can be problematic to match in regards to colors, stains, wood grains and etched designs. We can help your furniture look like new again because we bring years of experience to the table working with antique, vintage, modern and commercial pieces. We carefully match your damaged furniture’s design so closely, others will most likely not be able to tell it was broken in the first place. After your piece is repaired, you can choose to have a protective finish applied in order to protect it from surface scratches, general ware and improve all around durability. Along with our master craftsmen (view our team), we also have a professional upholster on staff that can help you breathe life into old dingy fabric. View our upholstery page here! A furniture finish has two functions: To protect the wood and to enhance its appearance. Without the protection of a finish, the wood surface becomes soiled, dull, and grayish looking. At times, the soil penetrates below the surface and never comes out, leaving dark blotches and rings. On woods like walnut, mahogany, and cherry, a finish really shows off the rich grain contrasts. We can help repair and refinish your antique furniture to it’s original luster. Give us a call or send us an email to describe your project. Send pictures of your furniture repair/refinish job to our specialists for a quick estimate. 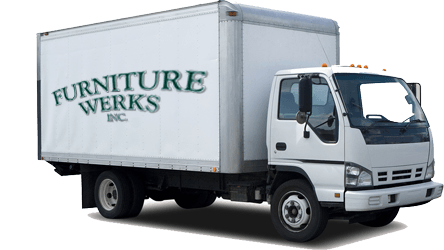 We can then pick-up your furniture at your location or you can drop it off at our facility. We require a down payment to start the job and the other half upon completion. We Accept Cash, Checks, and Visa and Master Card!